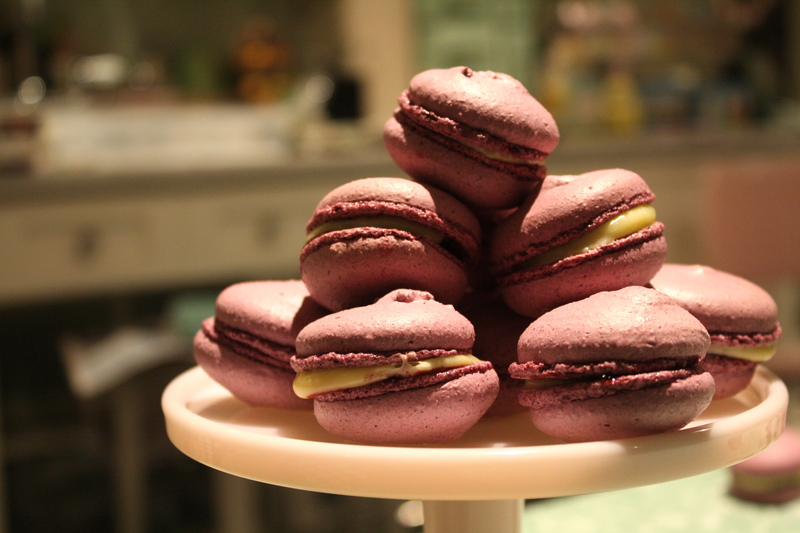 Blackcurrant macarons with white chocolate ganache filling. Things to know: The meringue base in this recipe has a hot sugar syrup beaten into the whipped egg white. It is important that sugar is completely dissolved before the syrup is bought to the boil, so use which ever quantity of water you feel comfortable working with. The water is going to be evaporated anyway, so the amount of water doesn’t matter. a measuring jug, covered with cling film that I punch a few holes in. This allows some of the water content to evaporated.The whites can be stored safely for up to four days. That said, I have made macaron with freshly separated whites, although it’s definitely easier to get beautiful shells with aged whites. Baking macarons on a rainy day is an exercise in futility. They need a low humidity atmosphere to crisp and dry. A bowl of ice water on stand-by is always a good idea when working with hot sugar. If you burn yourself, immediately apply cold water to the burn. On a sheet of paper the same size as your baking sheet, draw rows of circles approx. 3.5cm (1 1/2″ ) diameter. Make the circles about 2.5cm ( 1″) apart and stagger each row of circles. Fit a large pastry bag with a plain round piping tip approx. 1.5cm (1 1/2″). Turn the cuff off the pastry bag back, fold the piping tip to the side and prop the bag in a jug or large glass. This makes it easier to fill your bag with the batter without it running out of the bag. Put the ground almonds and icing sugar into a food processor and pulse until evenly mixed and the almonds are finely ground. Be careful not to overprocess, as the almonds can turn oily if over processed. Sift into a large mixing bowl, and whisk in the FRESH AS fruit powder. Clip a sugar thermometer to a medium saucepan, add the regular sugar and water to the pan. Stir over low heat until every grain of sugar is dissolved – if some crystals cling to the side of the pan, wash them down with a wet pastry brush. Do not allow the syrup to boil until the sugar is completely dissolved. Then raise the heat and boil undisturbed until 110 C. (230 F.). Remove pan from the heat. Divide the egg white into two batches of 110 gm (4oz.) each. Place one batch into the bowl of a stand mixer fitted with the whisk attachment. Put the other amount in a small bowl and if you wish to colour the batter beyond the shade that comes from the fruit powder stir in a few drops of food colouring, ( try not to stir these whites beyond a foamy point ). Set the coloured whites aside. Starting on low speed whisk the whites in the mixer bowl until foamy, then increase the speed and whip until soft peaks form. Turn off the mixer. Put the sugar syrup in the pan back on the heat and return to the boil until 118 C. (245 F.). Immediately pull from the heat and with the mixer head raised, trickle as small amount (approx. 2 tbsp.) onto the beaten whites, lower the mixer and beat for 10 seconds. Keep repeating this until all the syrup has been added to the whites. Do not be tempted to just trickle the hot syrup into the bowl whilst the mixer is going, that tends to throw the syrup onto the side of the bowl, where it will immediately stick fast, and you also run the risk of hot syrup being flung out of the bowl, and this hot, that’s a nasty burn! Beat on full speed for 2 minutes, then check the temp. of the whites, either with an instant read thermometer or by placing a dab on your lip. The whites need to be about 50 C. (120 F.) which will feel warm, but not burning to touch. Stir the liquid whites -which you make have tinted with colouring- into the almond/ sugar/ fruit powder. This may take a bit of elbow work as this is quite a stiff mixture. Then take about a quarter or the warm beaten whites and mix into the almond batter to lighten it a little before folding both batter and whites together. This is the crucial stage known as macronage. The aim is to take some of the air out of the batter, so that when piped they will hold slight peaks, that will flatten out on sitting, but not so much air beaten out that the shells pipe out runny and flat. A good way to check if you have folded sufficiently, is to pipe a Tbsp of the batter onto a small plate, tap it a couple of times on a hard surface and see if it settles into a smooth disc. Many of the books I’ve referenced refer to the batter “flowing like lava” at this stage, but as I’ve never seen lava, this was not terribly helpful to me. Place the guide sheet of circles under a sheet of non-stick baking paper, on top of a baking sheet. Scoop the batter into the prepared pastry bag and holding the nozzle vertically, pipe the batter until it reaches the edge of each circle. Lift the sheet and rap it three times on the counter. This is to help any peaks settle and encourage the batter to form neat discs. As you can see from the picture, I forgot to take my own advice and didn’t test my piping consistency, and my shells had slight peaks. The fruit powder seems to make the batter much stiffer than usual and this batch could have done with a few more swipes of the spatula. Preheat the oven to 150 C. ( 300 F.). 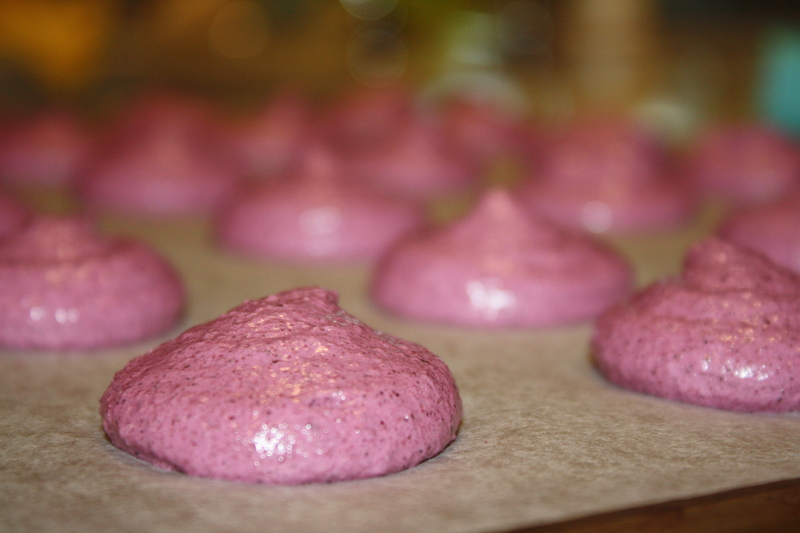 Let the macarons sit for 30 minutes to allow the surface to dry slightly, then bake for 12 – 15 minutes. You are looking for the macarons to have a set surface and a slightly moist interior, but with no browning. In my oven I find that I need to put them in at 150 C. to make them rise on their foot, but then lower the temp. after five minutes to prevent them browning. Check by lifting the edge of a shell and see if it has a set bottom, although it is normal for there to be a slight sticky patch in the center. Slide the baking paper off the baking sheet onto the counter and allow to cool completely. Slide the next sheet of piped discs onto the baking sheet (no need to allow the baking sheet to cool) and bake each sheet the same way. Don’t be tempted to bake more than one tray at a time , as the goal is to dry the macarons, rather than bake them, and too many sheets in the oven will make too much moisture. Once cool, peel them off the baking paper. If you have problems with them sticking, try peeling the paper downwards over the edge of the counter and catch the shells. If all else fails put them in a low oven to dry a bit more. The baked shells can be filled immediately or they freeze very successfully in an airtight container, with crumpled paper towels between the layers of shells. Things to know: choose a chocolate with cocoa butter listed as an ingredient on the label. Many white chocolate brands use other fats, eg. palm oil, and they don’t emulsify in a ganache nearly so well. American readers, NZ cream is equivalent to US whipping cream. Chop the chocolate into small pieces so that it melts evenly and place in a bowl. Bring the cream to the boil and pour over the chocolate and stand for one minute. Gently stir together until completely smooth – try not to whisk air into the ganache. Allow to cool until a small dab on your lip feels tepid (40 C. or 100 F.), then add the butter in small chunks, and whisk until smooth. 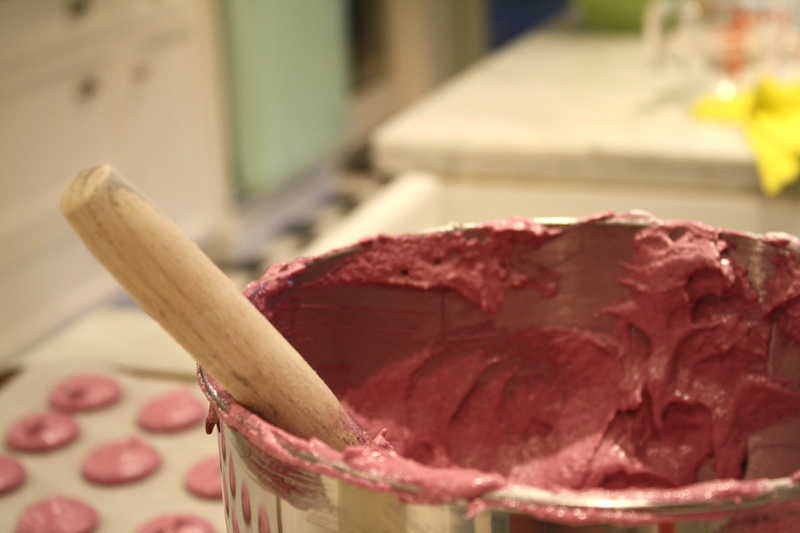 An immersion blender stick will give the silkiest texture to the ganache. Allow to cool until the ganache is of a spreadable consistency, then pipe or spoon a dollop onto half the macaron shells, then top with another shell and press the two gently together until the filling is flush with the shell edge. I found that it was better to just pipe a few shells at a time, as the ganache firms up quickly once piped, and as the shells are fragile, they tended to crack if too much pressure was applied to sandwich them together. The macarons taste infinitely better if they are allowed to mellow overnight in an airtight container in the fridge. Yummy – I’ve been salivating over those powders, but didn’t know where to start with them. Karen, great to discover your blog through Chrissie, am lovin’ it. Hi there just wondering how much the powders are. I am in Australia and have been searching for them. 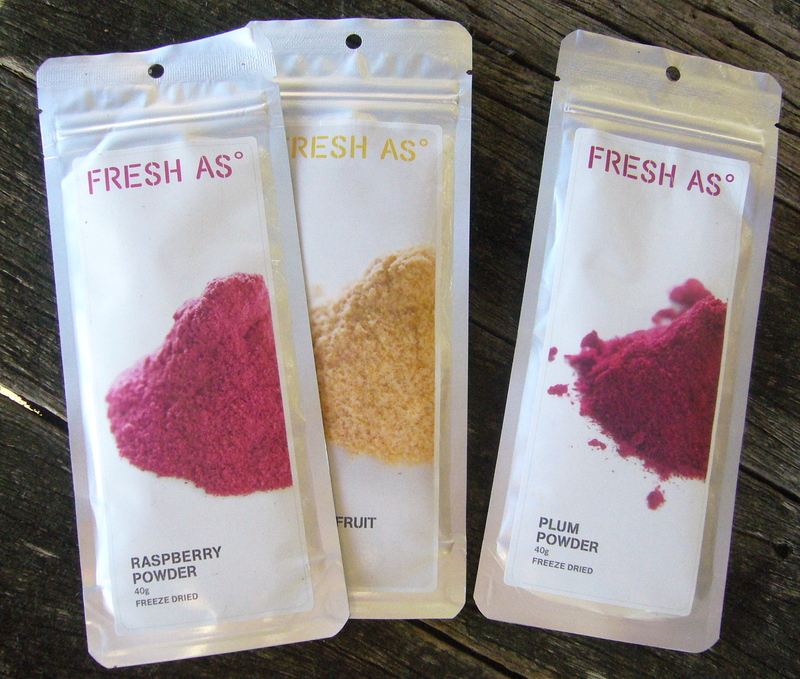 Hi, I saw these fruit powders in my local new world and had the exact same idea as you – I was wondering, do you think it’s really necessary to use the whole sachet (40g) in one batch? What level of flavour do you achieve with that much? 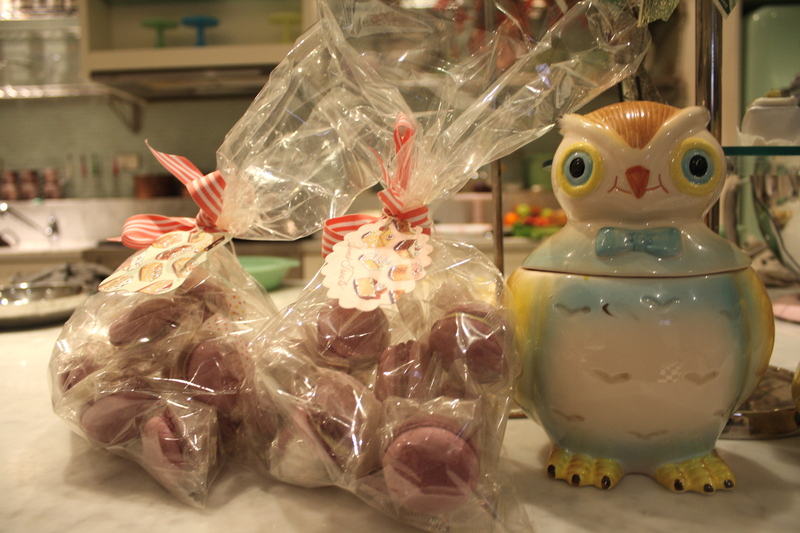 I’m curious as at $10 a sachet that adds up to rather pricey macarons!